Why choose HOTPDR pdr dent repair tools? Within their average lifetime most vehicles will get a door ding or a dent. Some of that damage will be major - requiring traditional bodyshop intervention. However, a majority of the damage will be minor car dents- caused by shopping carts, door dings and hail damage. Imagine offering this enormous market a revolutionary, money-saving, fast and efficient mobile service for repairing car dents. This is HOTPDR Paintless Dent Removal! Increase the efficiency of your current bodyshop business with PDR TOOL. Because PDR will free up your spray booth, you'll be able to do more repairs and make more money while reducing labor and material costs. Efficient and safe to pop a dent, door ding and dent repair paintless on the metal surface, such as auto, motorcycle, refrigerator, washing machine etc. No damage at the paint. Hotpdr dent removal tools paintless suitable for any person to deal with any dents and a good gift for your friends or families. Main materials:Stainless steel,rubber & durable plastic. 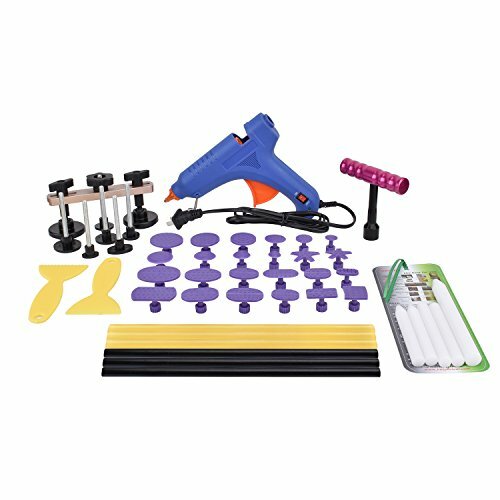 Dent puller kit which are designed with ergonomic can save labor and easy to operate, very sturdy and have a long lifetime. Instead of repairing car dent in auto car body store, these dent repair kit could save a huge amounts of money. We are professional manufacturer, focus on quality of pdr kit. Let's get them bought for your lovely cars. If you have any questions about this product by HOTPDR, contact us by completing and submitting the form below. If you are looking for a specif part number, please include it with your message.